Family Biking: What to do with all these helme(n)ts? Just chucking them in a bike basket, bag, or other vessel. This works until you need to actually put your takeout/groceries/whatever in the vessel. Stacking them neatly in a chair. This works so rarely I took a picture of it when it did. 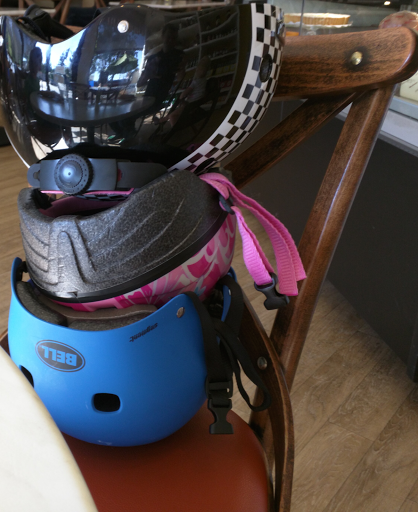 Trusting in the goodness or disinterest of humanity–leaving the helmets in the bucket of the kr8 or dangling from the handlebars or kid seats. Downside to this option is that people could take or mess with the helmets or they could get innocently rained on / pooped in / etc. Split the difference and leave my helmet and carry the kid helmets in. I usually go with B2 since finding acceptable kid helmets is much harder than finding adult helmets and I can easily replace mine. If there’s a better way (other than a mythical helmet/coat check service with valet bike parking) I’d love to hear it. If the kids are strapped down in the Kr8 why do they need to wear helmets? Kids don't wear helmets when strapped in a car seat do they?